This is a tool that allows you to look up how a particular word is actually used by sifting through a database of Japanese newspapers, theses and blogs. You can find out whether Japanese people often use your chosen word or whether they seldom use it at all. You can find out how words with similar meanings differ. You can look up what other words (verbs etc.) are often used in tandem with a particular word. 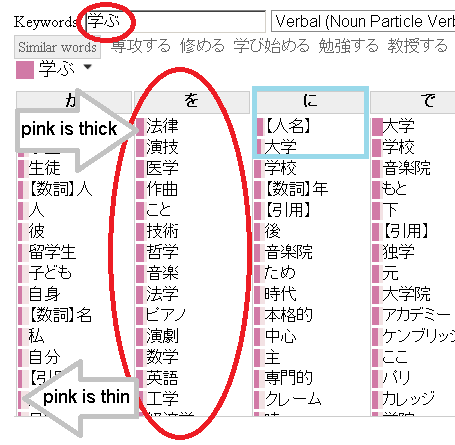 You can see which particles (ga, o, ni, de, kara, yori, te, e) are used with a word. You can also find out whether a word is one often used in academic theses, or the kind of everyday Japanese often seen in blogs. Try using 'Natsume' when you've looked a word up in the dictionary and you still aren't sure. "学ぶ" or "習う"? How do these two words used to express 'to learn' differ? Is the phrase "法律を習う" used? The phrase "大学に学ぶ" is written in a Japanese book of yours, but isn't the correct phrase actually"大学で学ぶ"? 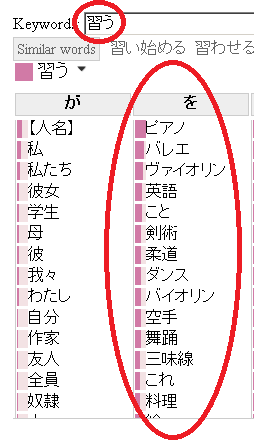 ...Words often used with 学ぶ are listed for you with those used most often at the top. Items with a thick pink line are the ones used often. As for "～を学ぶ", we can see that the combinations "法律を学ぶ" (read/study law), "演技を学ぶ (study acting)" and "医学を学ぶ" (learn medicine) are used often. Terms such as "学生が" (a student~), "大学で" (at university) and "学校で" (at school) are also used together with "～を学ぶ". As for "～に学ぶ", it seems this is used most often with a person's name preceding it, as in "○○○氏に学ぶ" (learn from ○○○). The next most common use is in the phrase "大学に学ぶ" (to be educated/to pursue studies at university). We can see that "～を習う" is used in the context of "ピアノを習う" (learn the piano), "バレエを習う" (learn ballet) or "ヴァイオリンを習う" (learn the violin). It seems that this is often used for activities where one moves one's body, e.g. music, dance or sports. Click on the word and underneath you'll be shown its frequency of appearance by genre. We can see that "ピアノを習う" is often used in newspapers (新聞) and in books/publications (書籍). It appears it is rarely used in the written language of theses (論文) and so on. In addition, you can compare several words and look up using linguistics statistical methods. This tool may be useful not only for those writing Japanese compositions, but also for individuals who are teaching Japanese and need to check on how a certain word is used or for those doing research on the language. 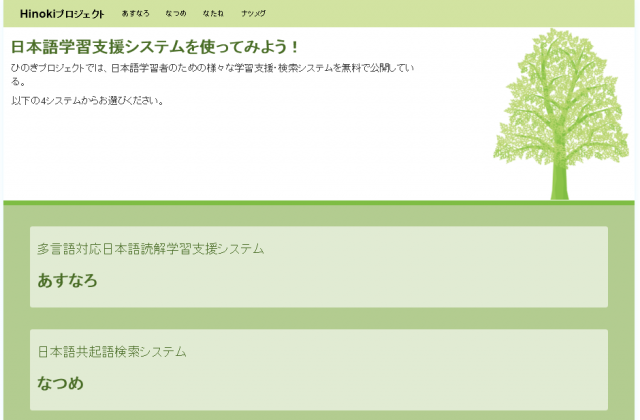 These contents are one part of the Online Japanese Learning Assistance Systems developed by the Nishina Laboratory at Tokyo Institute of Technology's International Student Center.